There was something on a rock that looked like a painting from far! Coming close, we realized that it was indeed a painting (a single one) but faded in color. 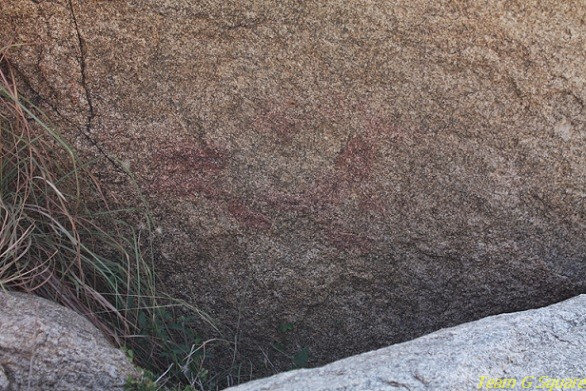 It was hard to recognize the subject of the painting, though for us it looked like a design pattern painted with red ochre color. Thinking this place would not offer much, we were back to the base of Dodda-betta (the big hill), and generally started wandering around the hill surroundings. The place looked like a perfect habitat for wild animals. 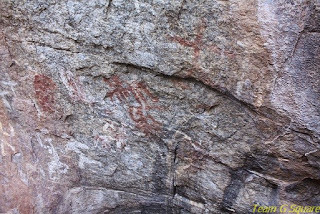 Walking along, we found a small cave that had enough water in it and some figures drawn with red ochre and white colors. After investigating these pictures closely, we realized that the red ones were surely pre-historic in nature but the white ones were the not so useful contribution of our generation! A few red ochre paintings were clear and the color was distinct. 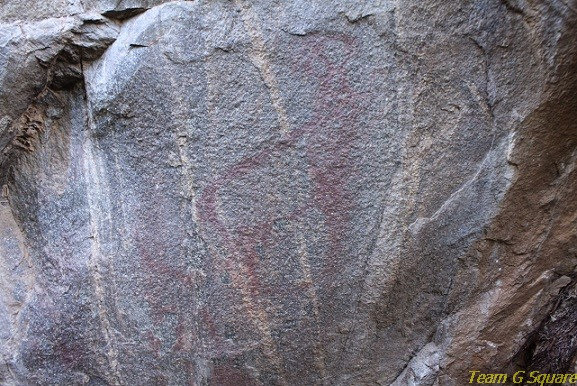 The cave paintings were of men riding various animals and of humans, but sadly most of these paintings have been carelessly vandalized by the modern art of our generation. 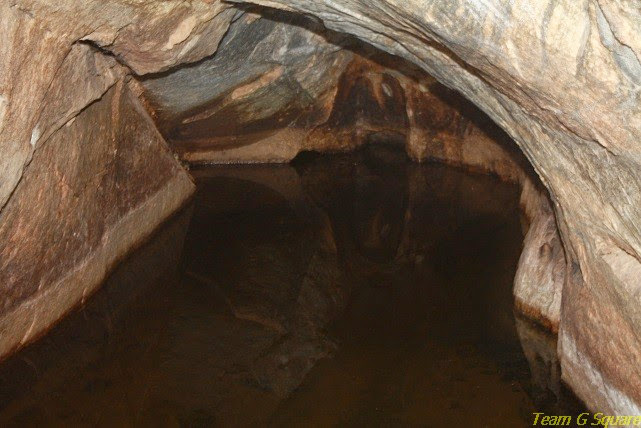 We searched the neighboring caves too but found nothing. We moved a little further and spotted another group of cave paintings of which, only one was clearly identifiable as a Deer. We found many other caves and ventured into a few in search of paintings, but in vain. We had to move on to other places and so we decided to return to our vehicle, though this time we chose to descend from the other side of the hill. The path chosen downwards was an adventure by itself. 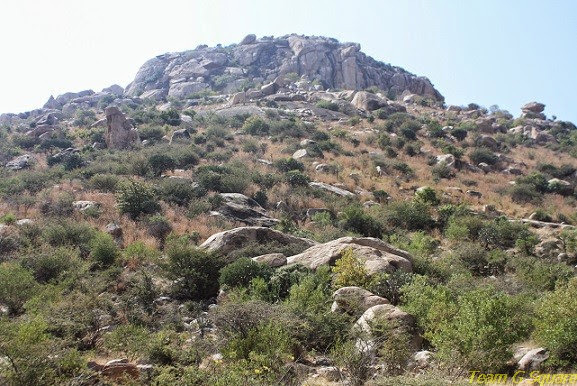 Without a proper route and surrounded by thorny vegetation, our descent proved less easy than expected. The descent though, was the second best part of our adventure after the spotting of the cave paintings! 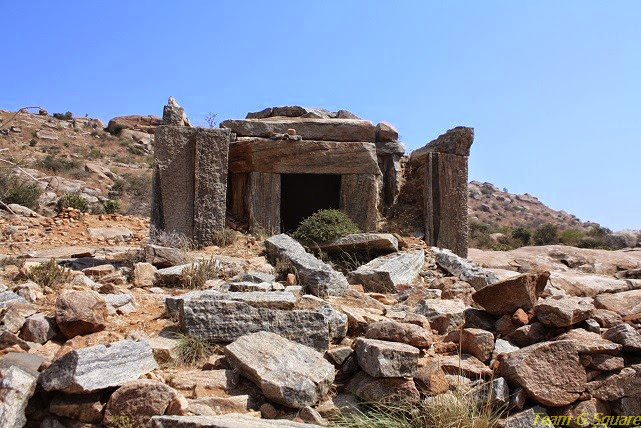 We were able to sight another ruined temple on the neighboring hill and decided to explore the same. 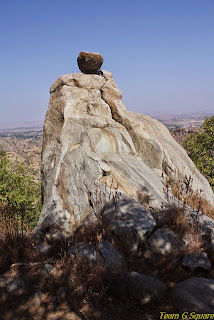 Our next destination was Bramhagiri which is about 5 km from here. At Bramhagiri, we met Mr. Manjunath, the official caretaker of all the Asokan Edicts present in and around Brahmagiri. 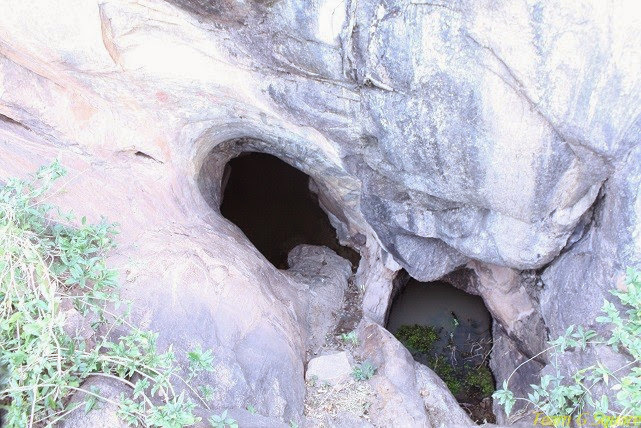 While discussing about Jatinga Rameshwara, he very excitingly told us about his experience during his last visit to Jatinga and that, one early morning he was chased away by three sloth bears. It is a fact that the locals of Jatinga regularly sight bears on this mountain and hence people always prefer to go well equipped and in groups. We were frightened for a second listening to all this and thinking back of our adventure in Jatinga. It sent jitters as we remember strolling around Jatinga leisurely and fearlessly! Great shots and what a fascinating place. Nice post and Great captures. The balanced rock reminds me of the butter ball( a bigger round rock) perched on another rock in Mahabalipuram. 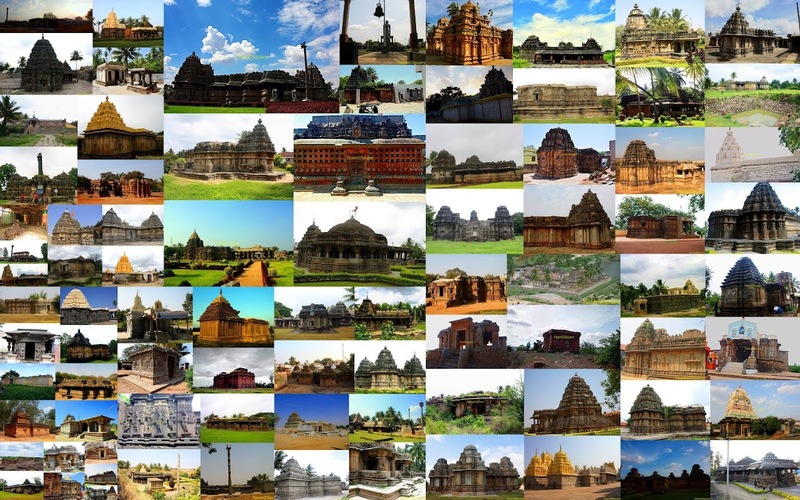 Terrific captures and such a fascinating place it is indeed!! I always look forward to posts/photos! They are the next best thing to being there myself!! Have a great weekend! Very new to me. Unique captures. That is a great find. Thanks for sharing this. Lovely find and post. Really fortunate you did not encounter bears! I'm glad you didn't encounter any of the bears during your adventure. 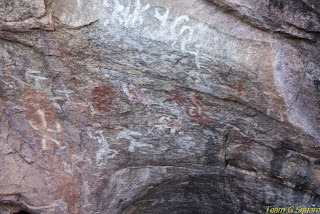 It's exciting that you discovered the cave paintings, but it's too bad that some had been defaced by the modern graffiti. Good exploration. Looks like a boring place from outset. But only you two can see and unearth the unseen. Good series. 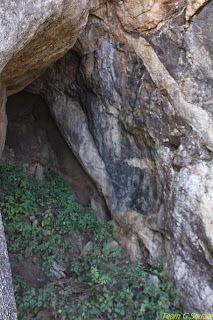 Amazing adventure this was, the cave paintings are a treat to see and so is the temple. Glad that you did not encounter any sloth bears but I guess, you should be careful of these things in future. great photos and wonder description. It is sad that the modern generation never cares to preserves the place. All they want is to create a name for themselves in history by inscribing their name. Good to visit your blog after a long time. Wonderful adventurous trip full of discovery. Lucky not to have encountered bears. For a long time I wanted to see the edits, particularly the famous one at Maski. compliments to you ! This is such a fascinating series and I have enjoyed it so very much! Glad you didn't encounter any bears!! A wonderful adventure! Thank you again for sharing it with us!! Those Rocks looks really good..and the place quite exciting..
Nice Captures .. worth exploring inside with proper equipment and safety ! how exciting this would have been for you Dheeraj..I could clearly see the deer painted on the rock...other paintings were little less clear though.It is saddening to know, how people dont really bother to preserve these great pieces of architecture, and would simply scribble around on the walls, destroying the ancestral value of this palce. Loved the post, what a wonderful adventurous journey...can feel the thrill from the pics.